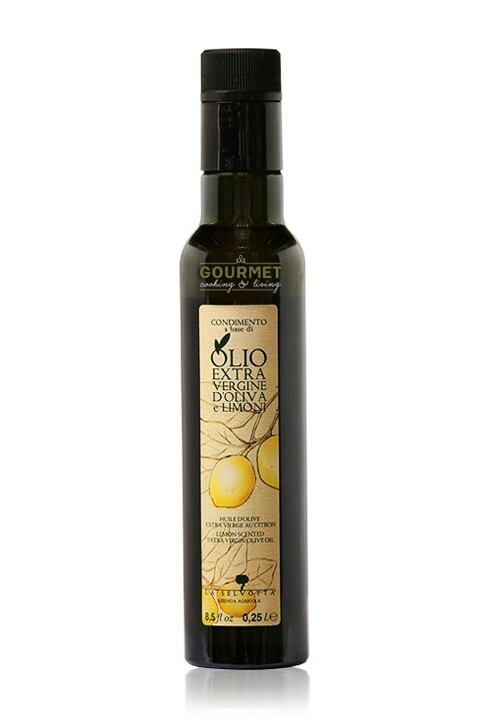 Different from the infused oils, this cold pressed lemon flavored extra virgin olive oil is produced naturally by crushing together the best olives with fresh lemon from the Vasto Hills, in Abruzzo, Italy. The oil is extracted slowly from the mixture, allowing the oils to be naturally enriched with the aroma of the lemons, sans any chemicals or extracts. This product is known as "Agrumato". This oil is an excellent natural condiment for salads, vegetables, meat and fish, or for the enhancement of baked sweets. It has a strong scent of lemon and a delicate taste. The oil has a deep yellow color with reflections of gold. Extra virgin olive oil, lemon.